Mrs. Ala Story, Santa Barbara, at least in 1957. Margaret P. Mallory [d. 1998], Santa Barbara; her estate; bequest 1999 to NGA. She lent the painting to a 1957 exhibition at the California Palace of the Legion of Honor. 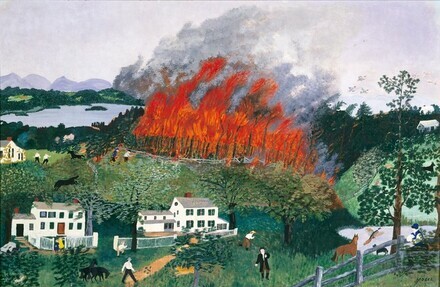 Ten Years: Grandma Moses, Galerie St. Etienne, New York, no. 33. Grandma Moses, California Palace of the Legion of Honor, San Francisco, 1957, no. 30. Collectors, Phoenix Art Museum, 1977, no. 29. Kallir, Otto. Grandma Moses. New York, 1973: no. 694, pl. 126.